Weird day. I spent many hours today doing web conferences, talking live, one-on-one with students in my online class. As long as I was talking to students, I felt positive and energized. As soon as I stopped, I felt demoralizingly tired and apathetic. Sluggish. As if a slug. A slug who ran out of antidepressants, so as far as slugs go, a downer, someone who the other slugs look at and say, who invited glum bum over there? underneath their slug breaths. I felt like two different people, like Dr. Jekyl and Mr. Hide-Under-The-Desk-And-No-One-Will-See-Me. It was as if each student arrived with a 20-minute energy shot, and as soon as the conference ended, meh. 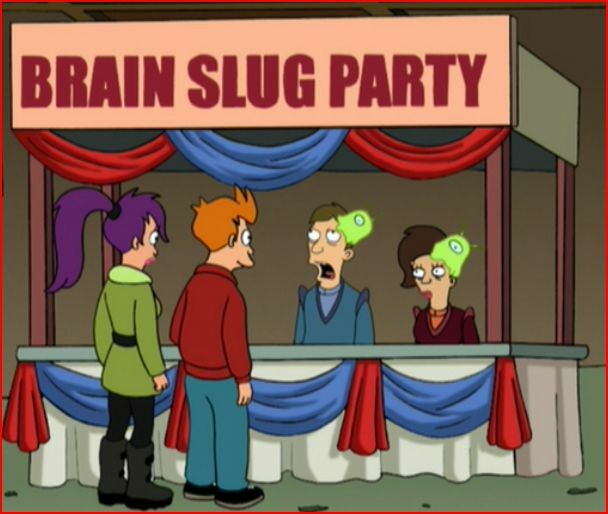 Here’s an interesting fact: if you Google “slug party images” you get pictures from Harry Potter movies. If I knew anything about Harry Potter, I would know why. I do know that Harry Potter sounds like an unkempt ceramicist. Meh is my new favorite word. Do slugs have bums? Or is bum used in the sense of vagabond, as in I wish that vagabond would pay for his slug-railroad ticket like everyone else! I don’t think slugs would use the word “slug” to describe everything in their slug lives. Its like email; eventually email will drop the e and just be mail. I wonder which is slower, slug mail or snail mail? I’m glad I keep the SafeSearch on when I Google images. Maybe Google’s upset about the whole Facebook IPO thing too.